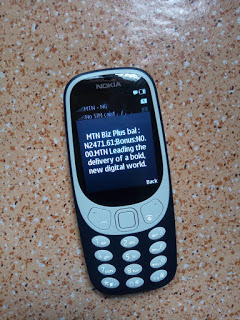 MTN is one of the best telecommunication networks in Nigeria which has served many subscribers to their satisfaction. MTN is fully known to be a network provider in Nigeria that do develop apps for it Value Added Services. 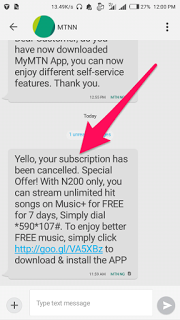 These value added services include MTN Music plus, comedy plus, etc. MTN value added services are known to be benefiting to all customers which leads to free browsing when the server is been cracked. It was MTN Music+ in 2015, later in 2016 was comedy+ that become a free browsing cheat, but all later stopped after the service provider blocked all loopholes. 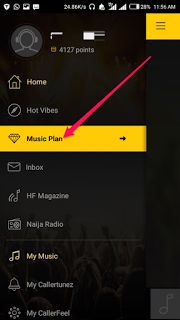 MTN Music Plus App is popularly called an online platform or an app in which you could listen to all contemporary Nigeria musics. 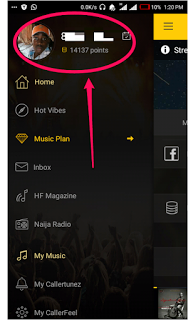 MTN Music Plus app offers free points while you be a part of the program using your sim. 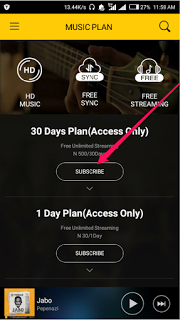 those points may be used to download or play musics. Aside that, you can exchange your accumulated point with airtime. 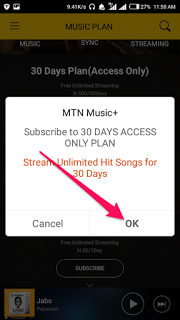 Right here in this post, I want to tell you how to get unlimited MTN Music+ points. Exchanged airtime won't be count as bonus, but as real airtime, can be used to make calls to all networks over nigeria and worldwide. You may also use this airtime to purchase Data Subscription of your choice. 2. 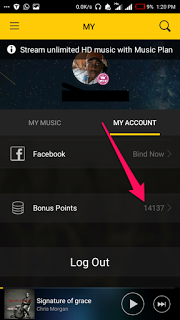 Launch MTN MusicPlus app and input your MTN number so as to sign in. Now click on Get Code and Six digits code will be send to you then Log in. 3. Now, make sure that you don't have Airtime on the SIM you use to Sign in. 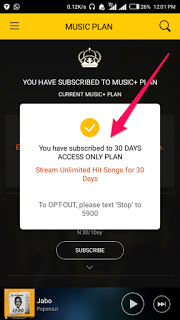 You will get a message saying "You have subscribed to 30 DAYS ACCESS ONLY PLAN"
7. Now Re-Do Step 4, 5 and 6 respectively to accumulate more bonus points. 8. Notice that each Activation = 1000 Points. And 4000 points gives #100 real Airtime. So you need to accumulate more. Once you have accumulated your points, you can exchange it for airtime credit. Click on the first box of N100 Airtime for 5000 Point exchange. 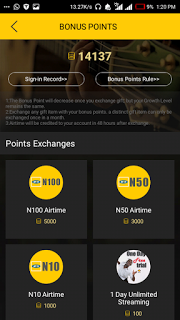 You can use this same steps above to Exchange all points accumulated to airtime. If you are not allowed to accumulate your bonus points Otherwise, then wait for the next 24hours and continue.